In July 2013, the Honourable Richard Chesterman published his report into the implementation of a new payroll system for Queensland Health, the public health body for the Australian state. In it, he outlined how he expected the system delivered by IBM to cost upwards of $1.2 billion over the next eight years. The replacement of the QH payroll system must take a place in the front rank of failures in public administration in this country. It may be the worst. It represented a catastrophic failure of vendor and project management, with blame apportioned to all sides. It also shows the potential financial impacts when vendors are managed poorly and communication breaks down. Vendor management is now a core competence in successful organisations. In an ultra-competitive global marketplace, businesses must look at creative ways to extract more value from suppliers, while simultaneously reducing risk and upholding quality. Simply beating them down on price year after year is not a sustainable strategy. This is where vendor management comes in. Done well, it's a repeatable, effective method for developing and monitoring third-party providers of goods and services, in order to derive as much value as possible from contracts and to build mutually-beneficial long-term relationships. In this article, we're going to take you through five key areas of vendor management, offering practical, actionable advice. We’ll get into a bit more detail on these topics below but first let’s take stock of the situation. A business’s approach to vendor relationship management (VRM) is generally looked at in terms of maturity. 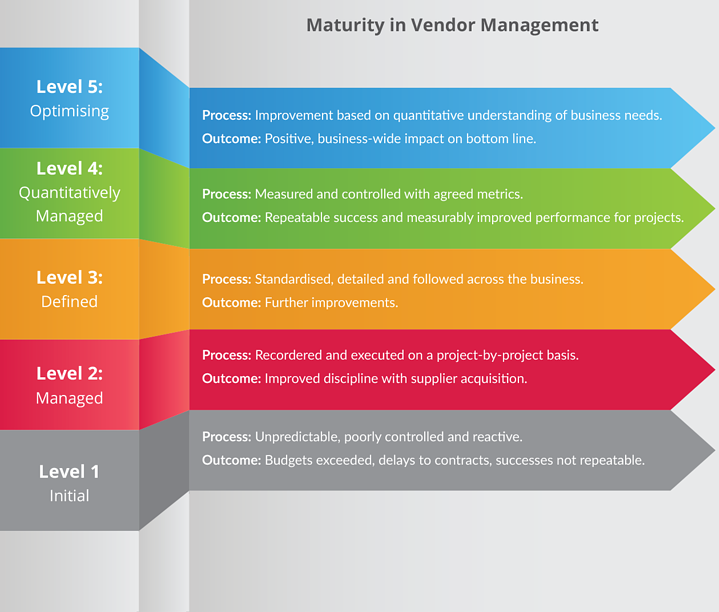 The diagram below shows the path to maturity in vendor relationship management. Take a moment to identify where you think your business sits on it. Wherever you identify your organisation being along this continuum, there is likely to be improvements you can make. Key to reaching stages 4 and 5 of the process is measurement and tracking relevant metrics that can be improved. what are these relevant metrics & Vendor Management KPIs and where should you start? The Institute for Supply Management (ISM) has identified five categories of supplier management activity that should be measured and managed to achieve a level of excellence. Let’s explore each one and see how this can help to move us along the road to optimising our management of suppliers. Information about the amount of money spent with each vendor on an annual basis is one key indicator of his importance to your business. Data needs to be collected from all types of financial transactions, summarised and then classified in a way that makes sense to you, and from which you can draw conclusions to help identify your key suppliers. Surprising results often come from interrogating and analysing controllable third-party spend. You might find suppliers that you have limited awareness of are receiving more significant sums of money than other higher profile ones. There is no one perfect way to segment vendors, choose a method that works for you. Key to this exercise is centralising your data into a spreadsheet or ideally, a dedicated vendor management solution. Strategic (key) vendors: High value, low volume and sole-source. Large organisations will often run VRM programs. These can help but will often require some significant investment into people and resources and so may only make sense for those larger businesses, when focusing on strategic suppliers or if automation can be achieved using a supplier management solution. It’s often easiest to start with a simple method of vendor categorisation by type to guide your activities. Many organisations have a problem with working openly with suppliers thinking that sharing operational and financial information leaves them in a weaker negotiating position. The opposite may be the case. Sharing of new technologies and innovative ideas can lead to added value and cost savings for both parties. Best practice is to develop relationships at many levels, both corporate and operational, ensuring overall visibility into the supplier’s wider organisation. This is harder to measure but may be counted in terms of number of supplier contacts and how often business reviews are conducted. Where there is poor or no focus on managing performance, all actions are reactive and unlikely to help improve delivery. If there are no agreed measures in place and no way of tracking what went well or what failed (and why), the chance of improvement is low. Best practice is to define, agree and implement Vendor KPIs which provide measurements based on actual historical performance. There should also be periodic reviews of the relevance of each KPI, its measurement approach and its target values to ensure it’s still relevant.Process improvements can only happen if evaluation reports are made available to both parties. Mature organisations publish scorecards and conduct formal performance reviews with suppliers at pre-defined intervals to promote best practice and enhance relationships. At mature levels, the focus is on alignment and improving communication channels. Best practice in risk management is defined by continually monitoring and having contingency plans for each risk area. There are many ways of categorising supplier risk depending on the industry you are in and, in most cases, the stakes are high for ignoring it. For example, high on the agenda in financial services are risks related to cyber security breaches, bribery and corruption, and exchange rate volatility. Conversely, in manufacturing, supplier fraud, logistics costs, product theft and environmental issues may be most important. All companies have financial, technology, security, contract and reputational risks. One hopes that there is at least a rudimentary risk management plan in place in all organisations. At the very least, you should be aware of the risks that are of relevance to you, especially those that are based on availability and price. Mature organisations apply weight factors to each type of risk and develop contingency plans. In addition, consider the advice of John Brown, a risk expert at Deloitte. “The big question is the frequency and level of assessments”. Brown says it’s a leading practice to assess riskier suppliers more frequently than those considered less risky. He adds that any time there’s a need to increase business from a supply-chain partner, or if a partner experiences a problem, it’s a good idea to reassess the risks of that supplier. The best risk plans define all possible scenarios and provide one or more solutions or mitigation strategies for each. The plan must be constantly monitored for any changes in the external environment and adapted as required. Any sole-source contract should have a plan B in place that can be activated with immediate effect. Perform a spend analysis on third-party spend for last year. Is it what you expected to see? Spend analysis is a window into your business. Review your segmentation of vendors based on the historical spend. What has changed? You may need to refocus on new or different suppliers. Talk to your key vendors about continuous improvement and how to open the lines of communication. Work on a development plan for key vendors and re-look at the KPIs. Are they still relevant to use to assess and monitor performance? If you don’t have a risk management plan, make one. Every company has financial and operational risks. If you have one, review it based on the economic situation you are facing now. Relationship building has its rewards. Adversarial vendor “relationships” help no-one so make sure you resolve any issues and work positively together. For more information on effective vendor management, you can read our related blogs. In addition, if you'd like to hear how vendor management software can help you drive efficiencies from your vendor group, saving time and money, then please get in touch today.